We’ve previously documented the strange case of Arthur Conan Doyle’s fervent Spiritualism, which Mark Strauss of io9 aptly describes as “hard to reconcile [with] the man who created the literary embodiment of empirical thinking,” Sherlock Holmes. Conan Doyle was so eager to believe in the existence of fairies and what he called “psychic matters” that he was frequently taken in by hoaxes. But the physician and novelist’s seemingly odd views obtained widely among his contemporaries who sought confirmation of the afterlife and communion with their dead relatives, millions of whom were lost in the Civil War, then World War I. People ask, what do you get from spiritualism? The first thing you get is that it absolutely removes all fear of death. Secondly, it bridges death for those dear ones whom we may lose. We need have no fear that we are calling them back, for all that we do is to make such conditions as experience has taught us, will enable them to come if they wish. And the initiative lies always with them. Two months later at a séance attended by thousands at the Royal Albert Hall, a medium claimed to have communicated with the Sherlock Holmes author. And four years after that, another medium, Noah Zerdin, held a séance attended by hundreds, and Conan Doyle is said to have been one of 44 who spoke from the beyond. This time, the event was recorded, on 26 acetate disks, which were only discovered 67 years later in 2001 by Zerdin's son, who donated them to the British Library. The 1934 recordings featured in a 2002 BBC radio documentary called What Grandad Did in the Dark. Just above, you can hear the supposed voice of Arthur Conan Doyle speaking from the spirit world. The audio is seriously spooky, but I'm not inclined to believe that it's anything more than a hoax, although the technology of the time would make manipulation of the direct recordings difficult. So-called "spirit voices" in recordings such as this are known as EVP ("electronic voice phenomenon"), and there are many such examples of the genre at the British Library, including a batch of 60 tapes made by a Dr. Konstantin Raudive, "who believed that the dead could communicate with the living through the medium of radio waves." A post on the British Library site comments that "the recorded evidence is not especially convincing, being short comments or fragments that without the accompanying spoken 'translation' would probably not strike the listener as having any meaningful content." 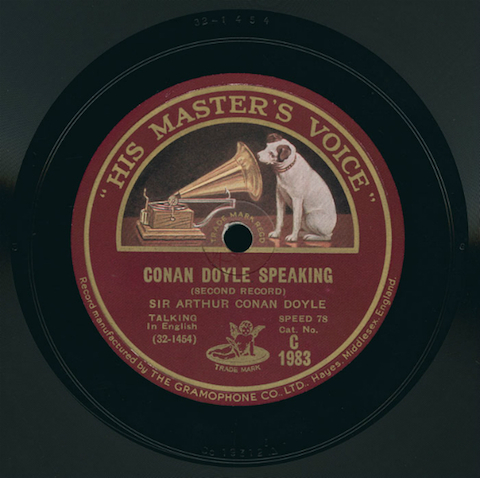 The Conan Doyle audio seems a little more coherent, though it's difficult to make out exactly what the voice says. Compare the two samples and draw your own conclusions. Or better yet, consider what Sherlock Holmes would make of this alleged "evidence." You can find Sherlock Holmes texts in our collections: 600 Free eBooks for iPad, Kindle & Other Devices and 550 Free Audio Books: Download Great Books for Free. Technically, this seance recording would not be classed as EVP – since the voice was generated through the use of a Medium and simply recorded for later playback. EVP recordings of Spirit voices or sounds are generated purely through the means of electronic equipment – without the need for a Medium at all. Though it would help matters if a Medium were to try EVP themselves ! I believe this might be my great Uncle James Laughton as the medium. I know he did a recording where he recorded the voice of Sir Arthur Conan Doyle. I would love to have a copy of this either digitized or if you know where I can get it on vinyl I’d be in your greatest debt. When Uncle Jimmy got old and had to be put in a home, his apartment in Detroit was looted and most of our family heirlooms and keepsakes of Jimmy’s were lost. I’ve been searching for bits and pieces of him. I know my parents had some very spooky things happen with him over the years that there was no explanation for.